Marcia Riman Selz spent her business career as a marketing consultant to financial institutions and investment companies. Her company, Marketing Matrix International, conducted studies on communications, service, product development, and branding. Dr. Selz earned her PhD in executive management from the Peter F. Drucker & Masatoshi Ito Graduate School of Management at Claremont Graduate University, her MBA from Loyola Marymount University, and her bachelor’s degree from Indiana University. Dr. Selz also has a master’s degree in psychology from the Chicago School of Professional Psychology. Dr. Selz grew up in South Chicago in a neighborhood of mixed ethnicities and religions. Currently, Dr. Selz volunteers as a life coach at Beit T’Shuvah, a Los Angeles treatment center for people with drug, alcohol, or gambling addictions. She also participates in the Volunteers for Israel program, where she spends two weeks each year working on an IDF base in Israel. In 1994, she chaired the Los Angeles Media and Marketing Division of the United Jewish Fund. In 1981–82, Dr. Selz served as president of the Southern California Chapter of the American Marketing Association. Dr. Selz currently lives in Los Angeles (Century City) with her husband, Dr. Eduardo Subelman. Dr. Selz is donating 20 percent of the profits from At Vitoria to charities providing social or health-care services and to organizations that conduct pancreatic cancer research. I’m so very grateful for my business career, which I owe to many people. I have to thank Mervin Field and my colleagues at Field Research Corporation  Aaron Levy, Eleanor Murray, Joie Hubbard, Jeanne Grunwald, Peter Sherrill, and Bob Friel. I worked at Field for 5 ½ years (1976-1982). It was there I learned the craft of doing survey research. This was after I had been an interviewer and owned my own interviewing service company. Field and its management were very generous with me…paid for my MBA classes, allowed me to stretch and learn about focus groups, quantitative surveys, project management, project costing, and project execution on a higher level than I had been exposed to previously. I remember telling Aaron Levy when he was considering me for Los Angeles area manager (the company was headquartered in San Francisco) that I only wanted to supervise interviewers and that was it. But it wasn’t too long after I was hired that I really became interested in marketing research and wanted to do project management and develop more clients in Los Angeles. I guess I was more ambitious than I had realized. Eventually, I needed more than what I could receive at Field so I gave a two-month notice that I wanted to leave and work on client-side. This allowed Aaron to find a replacement for me and train him. Aaron, Merv and all the research directors mentored me. They shaped my career and as I became experienced, I followed their example and mentored others. Once Aaron found a new manager for Los Angeles office, I started my job search in earnest. Based on the projects I worked on at Field, I had two areas of expertise: restaurants and banking. I tried to find a marketing job in the food service industry (I loved testing new restaurant concepts and dessertsthe highest profit item on the menu), but after three or four rejections of “we have no openings”, I expanded my job search to financial institutions. I was hired by First Interstate Bank as Vice President and Manager of Marketing Research, and after two years, was promoted to Manager of Marketing for World Banking in the newly created First Interstate Limited. Working at First Interstate was a wonderful experience. I gained insights from the inside out into how large organizations operate, corporate politics and retail and corporate banking. It was a better education than I could have dreamed of and beautifully dovetailed the schooling I had at Loyola Marymount University, where I earned my MBA. I worked at First Interstate for five years and early in 1987, I was ready for a change. I was recruited to work for Pilgrim Mutual Funds, and again, a great education in delivering financial services, only this time it was to investors through financial advisers. At Pilgrim, I met Barbara Passino, a wise and wonderful woman. However, that Fall, my daughter was going into her senior year of high school and I felt I needed to be home more. So I offered to provide Pilgrim with the work that I was doing, but through my own independent company. It was a win-win for all. I was able to be more attentive to family matters, do the work and I believed that Pilgrim could reduce its overhead by not paying benefits for me. I formed Marketing Matrix and worked for Pilgrim on a project basis (my first client). Barbara was kind enough to recommend me to other mutual fund companies for focus groups and surveys, and as my reputation grew, so did my company. I learned that the equation for being a successful entrepreneur was simple: do what you said you would do, in the time you said you would, with more value than what the client was paying. During its 30-year history, Marketing Matrix worked for more than 60 financial services companies including mutual fund groups, banks, insurance companies and money managers. We completed projects on communications, branding, advertising, websites, sales literature, customer service, product development, advertising, and marketing issues of all kinds. I was passionate about marketing research and consulting because I resolved my clients’ information deficit by providing findings that gave strategic and tactical guidance for next steps. For me, this was very satisfying and ego-building. I also honed my presentation skills by speaking to small groups around a conference room table and large groups at conferences and symposiums. Owning a small business also helped me become more sensitive to employee issues and business operations. As the business owner, I had the latitude to attend educational seminars and ultimately enrolled in the Peter F. Drucker Graduate School of Management at Claremont Graduate University. After 7 years of classes, taking my qualifying exams and writing my dissertation (Toward a Model of a Gap Analysis Between Leaders, Investors and Intermediaries in the Mutual Fund Industry) “ugh”, I earned my Ph.D. in executive management. This was a long way from my Bachelor’s degree in education from Indiana University. Actually, when I was a junior at IU, and home for summer vacation, I told my father that I wanted to go to law school after college. He dissuaded me from this idea saying that being a lawyer was not a profession for a woman (whatever, it was 1966). Years later, when I would remind my father of these words, he would always answer me the same way, “You did alright.” I’m working on my next novel which has an arc about my father, a guy whose personality and outlook on life were shaped by being the son of immigrants, growing up during the Roaring 20’s and Depression years, as well as his Navy service during World War II. He was a loving father, but also a man with some shortcomings. My father instilled in me my love of education. I remember when I was a young child, he would come up to kiss me good night and I would ask him a question about one thing or another, he would respond by saying, “Let’s look it up in our encyclopedia, the Book of Knowledge.” I would say, “It’s not that important,” but he would find the right volume and read me the answer. He gave me my curiosity because he liked closure to questions. I love going to school and in 2010, I earned a master’s degree in psychology from the Chicago School of Professional Psychology. (I have a lot of initials after my name.) I think it is my love of learning that helped me write At Vitoria. This was a 12-year project. From my first visit to Spain in 2006 and the side-trip to the city of Vitoria-Gasteiz, to years of researching the Spanish Inquisition, life in Medieval Spain and the specific story of the Jewish cemetery, it was a wonderful experience. I don’t mind these long projects because I know I’m going to get older no matter what, so I might as well fill the years with accomplishments. That is why over the years, I have done many different things. For 10 years, I have volunteered as a life coach at Beit T’Shuvah, a Los Angeles treatment center for people with drug, alcohol, or gambling addictions; participated in the Volunteers for Israel program, where I spend two weeks each year working on an IDF base in Israel; chaired the Los Angeles Media and Marketing Division of the United Jewish Fund and served as president of the Southern California Chapter of the American Marketing Association. I believe fully in being a participant, not a spectator. My parents set that example for me and insisted that I follow a course of community service. When I was 13 years old, my mother encouraged me to join B’nai B’rith Girls (BBG) a Jewish service organization. I was active because the mantra was “you only receive back as much as you put in”. Besides friendships and activities, in the summers of 1962 and 1963, I attended the B’nai B’rith Youth Organization (BBYO) International Leadership Training Conferences. What wonderful childhood experiences! I continue to give back in action and financially. That’s why I am donating 20 percent of the profits from At Vitoria to social and health-care services and to organizations that conduct pancreatic cancer research. 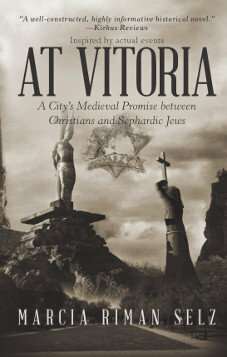 I’m grateful that I actually had the wherewithal to write At Vitoria and now have the willingness to share its proceeds.